Kenneth Walsh enlisted in the Marine Corps in December 1933. Ken served aboard the aircraft carriers Yorktown, Wasp, and Ranger as an enlisted aviation mechanic and radioman for four years. Assigned to fighters with VMF-121, Ken was promoted to a Warrant Officer in May 1942 and then transferred to VMF-124 and was commissioned as a second lieutenant. VMF-224 was sent to the Guadalcanal in the Solomon islands in February 1943. Flying the first F4U Corsairs to see combat, Ken downed two Mitsubishi Zeke fighters and a Aichi Val Dive bomber on April 1st. where he shot down 3 Zekes becoming an Ace. Ken scored multiple victories on almost all of his combat missions and by August 1943 his record of victories totaled 20. Returning to the States after flying three combat tours, He was awarded the Medal of Honor by President Roosevelt on the 14th of February 1944. 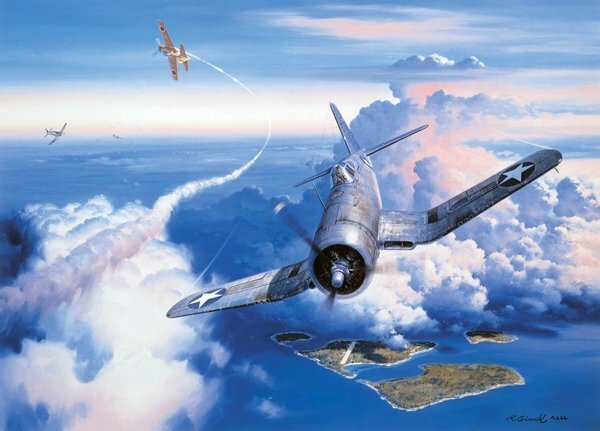 After serving as an instructor, Ken was back flying the Corsair and increased his score to 21 bringing down a Zeke Kamikaze 15 miles north of Okinawa.